There's no explosions, there's no additional cast, but there is multiple fascinating characters in "Men on the Verge of His-Panic Breakdown," at West Hollywood's Macha Theatre every weekend until June 25. 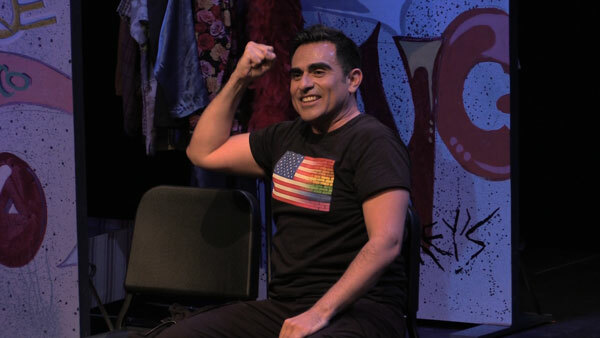 His-Panic actor Armando Rey puts on a stellar performance as he transforms into different characters to perform several different monologues of various Latino immigrants dealing with transcultural shock of race and gender identity. The premiere performance on June 2 had the attendees captivated and laughing at each punchlines. Although it was only one actor the different characters had their own mannerisms and at points even their own accents. The play deals with several serious topics, but doesn't get preachy about any one topic, rather it goes into hilarious anecdotes. Rey has a charismatic manner about him which keeps the attention on him and with the delivery of the material well timed that there is no boring point in the play. Although the play takes a lighthearted approach to dealing with the social issues which include the misadventures of the naive Federico or "The Gay Little Immigrant That Could" who arrives in Los Angeles during the first day of the 1992 riots and believes he's witnessing the filming of another Lethal Weapon sequel. With the inclusion of the riots and the story of Federico, who is knocking on the door of his pen pals who promised to take him in when he reaches the US but quickly slam the door on him when he gets here, this story takes three parts and uses humor to benefit the impact of the story. The jokes come from an exaggerated telling of a real person who playwright Guillermo Reyes actually met. "The Demon Roommate," a lonely young man with an apartment a little too close to the airport, is another monologue which has some dark comedic elements which set it apart from the rest of the play. This creepy character who is searching for a roommate after the incident with his prior roommate is stellar as the play goes into intermission after the intense performance. A short Q&A was help with writer Reyes, actor Rey and director James Donlon after the play. During the Q&A actor, producer, writer and award winner Dan Guerrero, who created and performed his own iconic one-man show "Gaytino" years ago, told Rey what a spectacular performance he put on. Audience members asked about the characters and where the inspiration came from and Reyes explained how they were developed from real stories he experienced and people he came across, even if they were changes to make the play more entertaining. The adult-only play "Men on the Verge of His-Panic Breakdown" will be making a 16 show run, which began on June 2 and goes through to June 25 at West Hollywood’s Macha Theater. The play will have performances Friday through Sunday ( 8 p.m. Fridays and Saturdays, 3 p.m. Saturdays and Sundays).